This post was originally part of my epic last entry for the Harvard Extended blog, but I have decided to split it off and post it now. It's a criticism of the Extension School's aggressive expansion into online/distance education. It's difficult for me to express, considering a good friend in the ALB program is completing his degree remotely. In addition, I have never taken an online class for credit at the Extension School -– all of my coursework was completed in person on Harvard's campus. Still, I have given this issue a great deal of thought, and I want to discuss it here. I feel the Extension School's distance education push has gone too far. 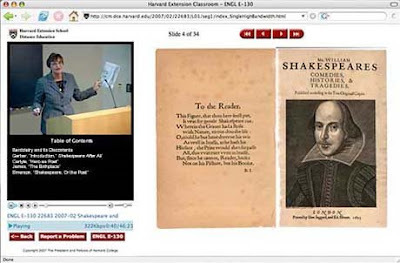 It's one thing for the Extension School to offer online lectures to people who want to sample Harvard's incredible faculty and course offerings. But permitting students in some programs to get most of their degree credit sitting in front of a computer terminal, often with few opportunities for direct interaction with faculty and classmates, is a mistake. Two of the Extension School's most popular degree programs -- the undergraduate ALB and the graduate ALM in IT -- allow students to complete 88% and 90% of their coursework online, respectively. Students can earn certificates in environmental management or applied sciences without ever stepping foot inside a Harvard classroom. I don't doubt the drive or abilities of these students (after all, some ALB candidates get better grades than their Harvard College counterparts in shared classes) but I am questioning the degree to which the Extension School has embraced for-credit online classes as an alternate means of educating students and awarding degrees. At the same time, I accept that the Internet offers benefits that are impossible to realize in the Extension School's real-world campus. Do the benefits outweigh the drawbacks? I am not convinced that they do – at least not yet. "We know that the constant exchange of ideas and opinions among students -- as well as faculty -- is one of the oldest and most important forms of education. … The Internet allows this process of dialogue -- of conversational learning -- to be transferred easily and flexibly into electronic form. 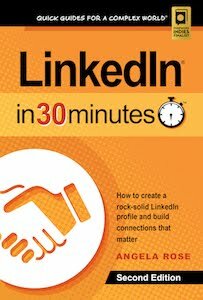 Communication can be carried on at all hours, across distances, with people who are on-campus or off-campus." For students at the Extension School, the Internet has certainly provided a special link. None of us live on campus. Many of us don't even live in Boston or Cambridge. Email, instant messaging, and the Web have provided connections to the school and to each other. These technologies have brought us closer, and they have also empowered us. My own thesis would have been impossible out without the Web. I used it to access HOLLIS and the LexisNexis Academic service, download text analysis software, and pass drafts back and forth with my thesis director while he traveled between Cambridge, Washington, and China. This blog is a product of the Web revolution, as is ExtensionStudent.com, where students and alumni gather to discuss classes, share advice, and debate issues relating to the Extension School. But I am skeptical that distance education based on asynchronous Internet technologies (i.e., prerecorded video, online forums, and email) is a substitute for live classroom discussion and other on-campus interaction. Distance education students can't raise their hands to ask instructors questions or participate in discussions, and it's difficult or impossible for them to take advantage of faculty office hours. Teaching assistants don't always respond to email, and online class discussion boards can be neglected by students and faculty alike. In this sense, the "process of dialogue" is actually limited by technology. The main benefits of distance education become issues of convenience and access – being able to watch lectures at any time from any location, replay important sections, and see lectures by professors who otherwise don't teach live classes at the Extension School. President Rudenstine saw some of these limitations. 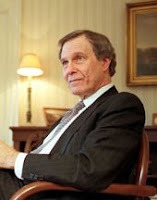 "No one should believe that electronic communication can be –- or should be -– a substitute for direct human contact," he said in his 1996 address. He stated that some technologies "permit an extension of the scope, continuity, and even the quality of certain forms of interaction," but added "communication over the network lacks other absolutely essential aspects of ‘real' conversations in the presence of ‘real' people." Since then, the University has treaded very cautiously with online education. There have been a few isolated initiatives, and online video lectures and downloadable course materials are offered to Harvard alumni. But only the Extension School has made a serious attempt to develop an online curriculum and allow some students who live in other states or other countries to complete the majority of their classes remotely. Every year I see an increase in the number of online options, and the HES website currently boasts more than 100 online classes, out of more than 600 total. The school really believes the convenience of online education and the chance to expose students to special Harvard faculty outweigh the disadvantages outlined above. If this is the case, the Extension School has failed to communicate or explain its reasoning, other than offering feel-good marketing copy ("Harvard Caliber, Course Credit") on the HES website. Also, if the DCE feels that distance education is an acceptable substitute for in-person instruction, then why do certain degree programs (such as my own, the ALM/Liberal Arts) insist on a much higher level of in-class experience than the ALB and ALM in IT? Distance education dovetails with the Harvard Extension School's mission to offer Harvard's educational resources to members of the community. Dean Shinagel references this in his welcome message on the HES website, noting that "we stand ready to serve the community, be it local or global." Harvard recognizes that the Internet is going to fundamentally transform education, and it wants to be prepared for the inevitable revolution. The Extension School has become Harvard's laboratory of sustained innovation and experimentation for distance education technologies and best practices. The last theory is a stretch, but it intrigues me the most. The Internet has already transformed many aspects of society and human communication, and it's not unreasonable to imagine a future in which people participate in "conversational learning" and the "process of dialogue" even if they are not physically sitting at desks in the same room as their professors and classmates. In fact, I agree with this vision. I just don't think it can be realized with streaming video, email, and online discussion forums alone. 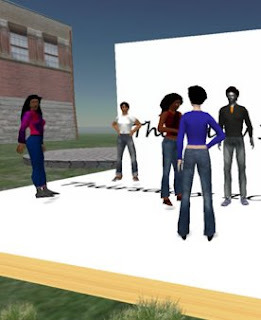 Virtual worlds offer some hope for making highly interactive distance education a reality, and in fact the Extension School is a pioneer in this field, thanks to a partnership with the Harvard Law School's Berkman Center for Internet and Society. But, as of mid-2008, the virtual world platforms and applications used for distance education are only halfway there. The interfaces are difficult to use, the environments are hard to build and prone to unexpected problems in terms of behavior and connectivity, and in-world meetings can't scale. This technology definitely is not ready for large-scale adoption (Disclosure: I am a board member of the non-profit Immersive Education initiative, which is trying to develop and promote virtual world technologies and best practices for education). Where does that leave the Extension School? Certainly, it's in a great position to capitalize on powerful technology and social trends, and potentially become a model for Harvard's other schools. But in the meantime, the technology is just not there. While I believe distance education is a worthy experiment, it is not a substitute for real-world instruction and discussion, and mostly online degrees should not be a part of a part of the Extension School's offerings. 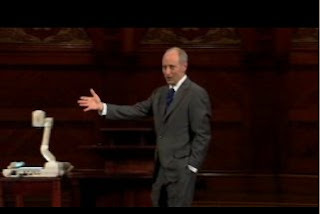 Later this month, I'll be taking my first online class, Michael Sandel's Justice. It won't be for credit, but will give me some more insights into distance education. Maybe it will even change my mind. I also welcome other Extension School students to post their own thoughts on distance education below. What are some of the benefits and drawbacks that I missed? Can anyone describe what the academic research says about distance education? Am I being unfair to the Extension School and students working remotely? To what degree should distance education for credit be allowed using current technologies? What is the future of online education? Update: Richard at ClueHQ has posted a lengthy response: Is Distance Education a Problem at Harvard?. He is a distance ed student in the ALB program, and his insights are definitely worth reading. I think one of the biggest differences in our respective arguments is you are defending online distance education from the point of understanding course materials. I am approaching this issue from the point of what a “Harvard education” means. It’s not just about having the campus experience, mastering course materials, or getting better grades than students who attend class in person. I firmly believe that a Harvard education — indeed, a university education — entails spending time in the same room with other human beings, listening to what instructors and classmates have to say, and asking questions. This is the process of dialogue that President Rudenstine referred to in 1996 — the discussions and sharing of knowledge that takes place when people are talking with each other in a direct manner, in person. It’s old school, but it works. I describe specific advantages of in-class dialogue vs. their online components in the comment as well. You can read the entire comment here. 3rd Update: I have written about my own experience with distance education after sampling a class through the Harvard Alumni Association. See "Follow-up: My online education experience" on the I, Lamont blog. My online math class: Convenience gets an 'A,' but at what cost? In the digital age, Widener is "almost a museum"
Earlier this week, I was lamenting the state of research and the dissemination of knowledge in academia. Despite the incredible tools at the disposal of students, scholars, and professors, paper is still the medium of choice when it comes to publishing research and sharing knowledge. "I believe that the liberal-arts education of the twenty-first century has to be different," he says, noting that information is no longer centered in Widener Library. "The library made Harvard -- we have always had the rarest things, the best repository of knowledge, [but] information now is digital; it is on the Web. Widener Library is very valuable, but it is almost a museum." When it comes to publishing, the Extension School is also very much oriented toward paper. Theses are bound in buckram and end up on shelves in Grossman Library. They may never be seen or read outside of the university community. I really hope to see the Extension School and other academic units at Harvard embrace digital publishing and other Web-based ways of distributing knowledge in the next few years, so our collective efforts can be truly shared with the world, rather than being restricted to the museums of paper that dominate the campus. Update: I just found out that in February of 2008, Harvard's Faculty of Arts and Sciences approved a plan that will "post finished academic papers online free, unless scholars specifically decide to opt out of the open-access program." The source indicates that the policy applies to professors, but it's not clear whether student papers or research will be published online as well. I received an invitation through the Harvard Alumni Association to take "Justice" online. The class is taught by Professor Michael Sandel of Harvard's government department. I've heard about this class for years, and the preview looked fascinating. It's a great opportunity to take it online for free. It looks like it will require a significant time commitment. There are 24 streamed sessions starting in September, plus opportunities to discuss the class with other alumni and even Professor Sandel. But it's a commitment I am willing to make. This is not just because the class looks interesting, but also because I have never taken online classes at Harvard, even though they were offered at the Extension School when I was a student there. I have some strong opinions about online education and its place at Harvard (which I will discuss in my final post for Post Harvard), but also realize that my viewpoints are limited by a lack of experience. When scholars from the year 2058 look back on the current state of academic research and the dissemination of knowledge, they surely will marvel at the fact that so much of it remained oriented toward printed words on paper. It is a surprising situation. Never mind that nearly all educated members of early 21st century society are already familiar with the World Wide Web, the most extensive and accessible publishing and communications tool ever invented. Despite this, many facets of the academic world remain firmly planted in the ways of the early 20th century. Whether it's writing a term paper or conducting a major research project, the fruits of students' and scholars' efforts usually end up as printed sheets of paper destined for a professor's mailbox, a filing cabinet or a university library. Even a doctoral dissertation that takes years to complete is probably going to exist as a paper hard copy in just one or two locations. The insights contained in it may never be read by more than a handful of people. This is not to suggest that academics are Luddites. Far from it -- most students and educators are very familiar with email, search engines, online databases, and Microsoft Word. But even if students use software programs to make and distribute a term paper or thesis proposal, electronic copies hardly ever venture beyond the hard drives of the students who created them, or the inboxes of the professors who received and graded them. On occasion, high-level research will be deemed good enough for a wider audience, but all too often these works remain restricted to books or journal articles that can only be seen in university libraries or expensive, password-protected databases. Fifty years from now, the scholars of the future will marvel at all of the ideas, hypotheses, evidence, analysis that were expressed but were only shared with a limited slice of humanity, despite the ubiquity of the Web and the many software tools at our disposal to share them with a much wider audience. This system will not only be viewed as inefficient, it will be regarded as isolating researchers from potential sources of knowledge and preventing them from making discoveries and improving our understanding of the world around us. But there is hope. I have mentioned initiatives at MIT, Berkeley, and elsewhere that are attempting to leverage the power of the Web to spread knowledge more widely (see Online education, sharing knowledge, and a proposal for Harvard and UC Berkeley's free lectures on YouTube). Harvard Extended itself represents my own personal effort to share my experiences, observations, and research findings with a wider audience, and has succeeded beyond my wildest expectations -- Google Analytics tells me that more than 3,000 visits to Harvard Extended have taken place in the past 30 days, and nearly 85,000 visits have occurred since I first started using the tool in May of 2006. Still, I want to do more. My blogging on Harvard Extended will come to an end in the next week, and it bothers me that the class papers I worked so hard on over the years do not have a permanent online home. Collectively, they took many hundreds of hours to research and write, and were shaped by my interactions with Extension School instructors, including members of Harvard's faculty. What a waste if they were to be resigned to a box of old papers in my basement, or a file directory on my hard drive. When I was still a student at the Extension School, I posted some of them to a fas.harvard.edu Web server. Unfortunately, I lost my FAS computing privileges when I graduated earlier this year, but I think I've found an alternate solution: Scribd. Scribd is kind of like the YouTube of electronic documents. Registered users can upload their PDF or Word documents, PowerPoint presentations, and random .txt scribblings. Anyone with a Flash-enabled Web browser can view them, or even embed them on their own websites, just like you can do with YouTube videos. The database is searchable and indexed by Google, meaning that people anywhere can readily find specific documents, if they use the right search terms. One thing that's missing from this small collection of papers is the most important paper of my Extension School career: my thesis (title: Making a Case for Quantitative Research in the Study of Modern Chinese History: The New China News Agency and Chinese Policy Views of Vietnam, 1977-1993). There's are several reasons I have not included it here. While Scribd is a very easy way to host documents, one thing that Scribd does not have is a vetting process or a reputation for reliability. The contents of an academic journal will have been vetted by experts and editors, and quality will be high. On Scribd, anybody can publish anything without it being vetted by anyone, and quality is mixed. For academic papers published on Scribd, the good appears alongside the bad. You'll find astounding creative works and rigorously designed research projects, as well as limp efforts at scholarly writing and even deliberate misinformation. Users can flag offensive content and copyright violations, but the process is flawed and leaves a lot of bad content on Scribd's servers. Interesting or quality content can also be highlighted by readers and illuminated with comments, but this system is imprecise in that it does not differentiate the praise from a 15-year-old kid trying to finish his homework and a 60-year-old university professor who stumbles upon a great paper on Scribd through a search on Google. You'll have to take my word that all of the above papers were submitted to Harvard faculty or Extension School instructors for review, and all received excellent grades. However, the weaknesses in the Scribd system have convinced me to hold off on reposting my thesis on scribd.com. I want it to have the largest possible impact on my field, and I don't believe it will have that impact if posted to Scribd. Instead, I am holding out hope for a Harvard-sponsored solution. Nearly two years ago, I petitioned the Extension School to archive masters theses in the same electronic database used for doctoral dissertations at Harvard, ProQuest UMI (Update: My thesis is now available through UMI/ProQuest). While this is a closed database that can only be accessed through university library systems, it is restricted to vetted, accepted research from university masters and doctoral programs. It is widely used in academic circles -- in fact, the literature review in my thesis referenced several dissertations that I had located in the ProQuest UMI database. I hope that someday my own thesis might also be useful to future scholars of modern Chinese history, Cold War history, and Chinese media studies, if Harvard decides to extend this resource to ALM theses from the Extension School.